If you identify as a highly sensitive person, an empath, or an INFJ personality type, you undoubtedly have encountered more than your fair share of toxic personalities and narcissists. Unfortunately, because our light shines so brightly (being natural givers), we are always going to be targeted by these types of people. What you need to learn is how to stop attracting them, and most important, how to recognize them and stand up to them when they are drawn to you. They can also help us instantaneously know if something is off about a person. For example, when I recently met a new coworker, I immediately picked up an “off” feeling about her, and recognized something she did and said as a red flag. After a few weeks, I noticed that I usually didn’t feel good about myself when she was around, and that she frequently lied. After a few months, it was pretty obvious to me (as a psychology masters candidate) that she had more than just a toxic personality, but also two personality disorders that are dangerous to empaths and HSPs because of our sensitivities. 1. Learn to recognize toxic personalities. If someone consistently makes you feel bad about yourself and constantly puts you down (even if they say they are just joking — a caustic sense of humor is a big sign of narcissism), you may be in the presence of a toxic person. Other signs include: they make you doubt yourself, your intuition, your feelings, and your ideas; you start to feel worthless around them. Mature, healthy people do not make you second guess yourself, your feelings, your ideas, your worth, or anything else. Healthy friends or partners will build you up, support you, and make you feel better about yourself, not worse. 2. Trust your intuition and establish clear boundaries. One of the biggest mistakes I have made in my personal journey is not trusting my intuition and waiting until I have noticed more red flags than I would like to admit. In these situations, it took a while to finally admit that this person was hurtful and I had to get away. If you get any kind of gut feeling or intuitive thought that something is “off” about a person – go with that. Take a step back, slow things down, and observe this person interacting with others. What do they do and say, and how do they treat others? Try to figure out who they really are on the inside. Toxic people portray themselves as innocent, charming, happy people, but deep down, they are envious and cruel. Similarly, someone who has a personality disorder, such as Narcissistic Personality Disorder, truly does get joy from harming other people. The more they tear you down, the better they feel about themselves. So, if your gut says something is not right, don’t brush that off. Your first priority should always be to protect your highly sensitive and empathic nature. No one who really cares about you would constantly put you down or make you feel worthless. 3. Beware of emotional baiting and learn to validate yourself. One of the favorite abuse tactics of a toxic person is to play with your emotions. They may purposely do things that they know will upset or hurt you, in order to get a reaction out of you. Sometimes this reaction is so they can get attention from you (also known as narcissistic supply), but other times, it is a way of setting you up for failure. If you are dealing with an individual who has a personality disorder, they will use your reactions to show others how “crazy” you are and pretend to be the victim instead of the instigator. 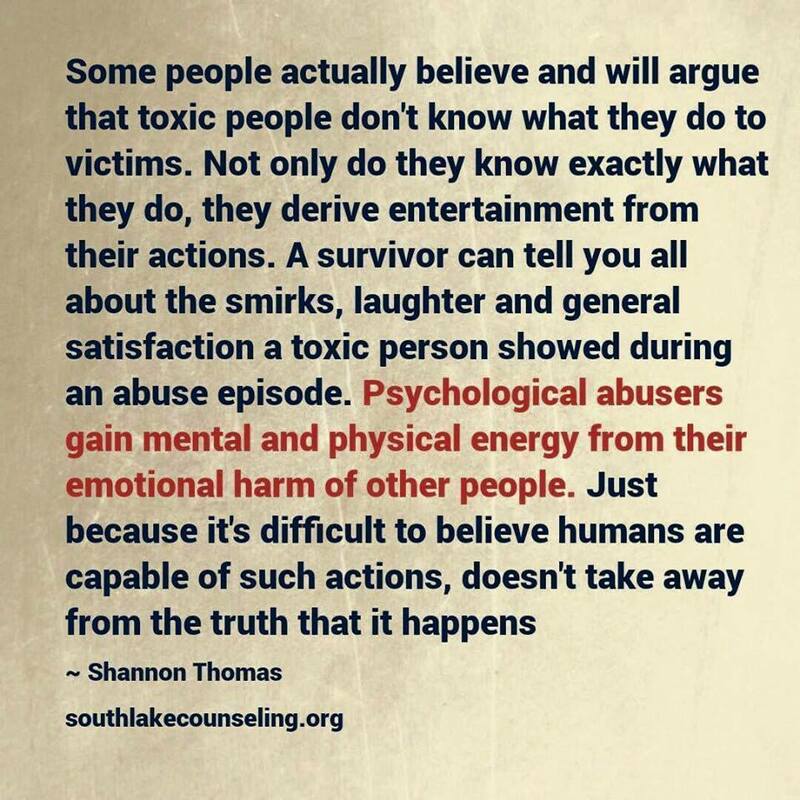 These abusive types are highly manipulative and can fool many people with their charming façade of fakery and superficiality. It’s possible that validation is something you did not get much of in childhood or in a previous abusive relationship. Often, abuse survivors find that those closest to them minimize the abuse that they have suffered or invalidate it with hurtful words like, “That didn’t happen,” or “Are you sure it was intentional?” These words from parents, family members, or anyone you trust to protect you and stand up for you are the absolute most hurtful things we can hear. That is why learning to validate yourself, your feelings, and what happened to you can make a world of difference in your journey. When you learn to validate yourself and not let anyone else tell you who you are or how you should feel about something, it makes it easier to get away from these toxic types. 4. Establish a “no contact” or “low contact” rule and stick with it. This is perhaps the hardest thing for us to do, especially because most of the people who have abused us are usually close to us, like a family member, significant other, or someone we thought was our friend. Sometimes the “no contact” rule that we refer to in the world of psychological abuse is not an option because you share children with this person, or they are a sibling, coworker, or parent. This does make things more difficult; however, the low-contact rule can be just as effective. Low contact can be anything from minimizing time spent with this person or maintaining your composure when around them and not allowing their presence to impact you (this is difficult if this person causes you anxiety, but it can be done). I tend to shut down my emotions and personality when I am around a toxic person, because I don’t feel safe. I do not share intimate details about my life with them, such as trauma from my past. Toxic people will use any information they learn about you against you, so simply do not give them anything to work with. This took years to achieve, and I am proud to say that I am much better at it today than I was even five years ago. For those gunning for the no contact rule, you will find that the less time you spend with this toxic person, the better you feel about yourself, the more energy you have, and the happier you are. You will also slowly start feeling like the person you were before you met them. No contact or low contact has helped me keep my sanity so that I can concentrate on helping others like we INFJs like to do. Protecting yourself from further abuse is also a key to recovery, and something you must absolutely do in order to survive. I hope this helps you on your own journey. If you are interested in learning more about overcoming the trauma of toxic abuse, I recommend the following books, as they have helped me and many others. INFJ. HSP. Introvert. Empath. MBTI Nerd. Army Veteran. Clemson Grad. Jedi Master. Husky Momma. Coffee Lover. Gardener. Reader of books. Activist for the Abused. Trauma Survivor. PTSD Advocate. Healer. Writer. Poet. Dreamer. Doer. Present & Future Goals: M.A. Candidate in Psychology at American Military University. Then working on a Masters of Social Work at LSU. And maybe even one day a Ph.D. in Psychology as well.